I couple of weeks ago I was selected to be a semi finalist for the final round of Project Style, my task was to put together a look using $150 (from the Shops At Wiregrass) and only using one piece from your closet. Of course, since $150 wasn't a huge challenge I lowered it down to $100 and just barely made it. Obviously because draping has become a favorite of mine I opted to go with the popular oversized trend, pairing palazzos and an oversized sweater with structured wedges and quirky jewelry. I can see myself wearing this look a lot in the coming cool months, and have even worn a few times here and there, like our Farmer's Market - cozy, chic, and effortless. Love love love the draping! You look so beautiful!!! love the draping and LOVE the rich colors - so perfect for fall! I absolutely adore the combo & the effortless look of the outfit, you look wonderful as always! 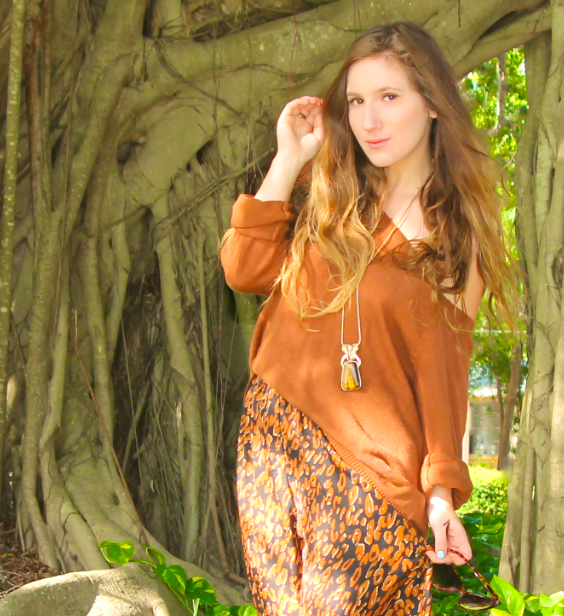 This look is so you and perfect for transitioning to fall! Love the rich colors and fabulous draping! $3 for the sweater...wow! Those pants are amazing on you! I love the rolled up sleeves on that sweater! Awesome outfit you put together! Good luck. I love this look on you! The jewellery is fantastic! I would ever have imagined that these colours would suit you, but they certainly do! Lovely! Love your draping!!! you look like an beautiful elves from the forest!!! I've always admired your draping. It's a skill in the Advanced Class which I envy but am too inexperienced to master. You're my beacon of fashion. 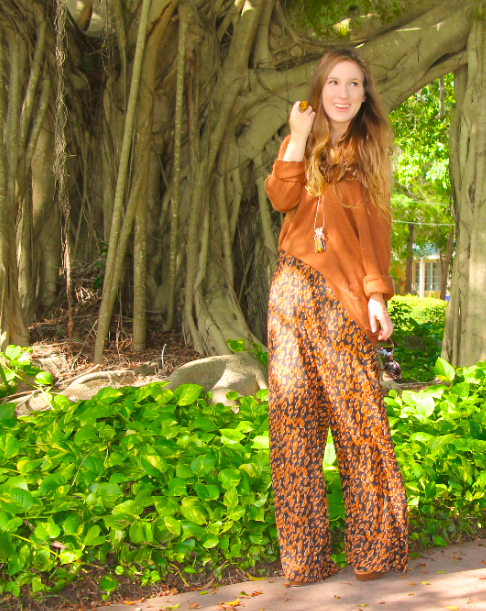 I have been loving wide print pants..Great look! I cannot believe these are from Forever21!! I need to get over there asap! I love your take on the draped look...so chic & so comfy!! Your pants are just amazing. Love the draping, love the colors.. you look beautiful! Congratulations on being selected as a finalist! Such a cute look and you pull it off beautifully! You do draping like a pro, and look absolutely beautiful in this outfit. Love the pants and the print! Looks fab. Great outfit! Love the pants, they give a really cool, relaxed 1970's vibe! Gorgeous - those pants suit your frame so well! this is a perfect fall look! Ahh makes me excited for autumn! I never would have thought that this many oversized pieces together would work, but it totally does! what a cute & creative outfit. you are darling. those pants are way too fabulous for words!! I love that while this outfit is meant to be drapey, you're totally wearing the outfit, not letting it wear you. You look great! Yummy colors look amazing with your skin tone! This look is so effortlessly chic, great pairing! Yes, effortless you nail it! I love those palazzo pants, you look great and always so carefree! Oh how I love printed pants :) You look lovely! You always look great in what you put together but I LOVE that this was under $100! i love this look!! the sweater is perfect! I these nice warm colors on you, they really compliment your skintone! Cute look! No one knows how to rock palazzos quite like you honey. You look fierce!